The Tigger'nator » I’m Not Religious…. Got this off a Facebook post, thought I'd post it. Sometimes people often think Christianity is about abunch of do's and don'ts, a list of rules, ect. we are saved by Grace. Of course we can't live like the devil, but do the best we can to live for God. Jesus asks us the best from us and it's a relationship with Him. 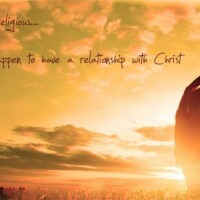 Im not religious…I just happen to have a relationship with Christ. This entry was posted in Images and tagged Christianity, relationship by Tigger. Bookmark the permalink. That is a great saying and a very good point… Well said. thx, yea, it's interesing how people seem to forget what Christianity really is about.